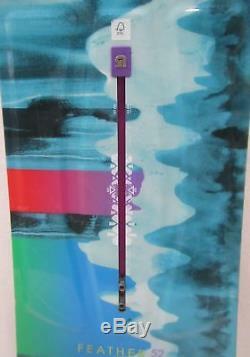 WOMENS BURTON FEATHER ALL-MOUNTAIN FREESTYLE FLAT ROCKER DEMO SNOWBOARD 152CM. 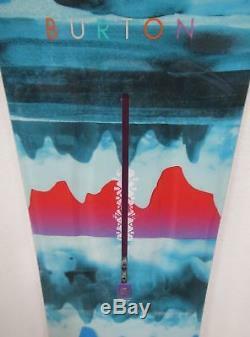 WOMEN'S BURTON FEATHER ALL-MOUNTAIN FREESTYLE FLAT ROCKER DEMO SNOWBOARD 152CM. COMES WITH ALL CHANNELS FOR THE MOUNTING SYSTEM EXCELLENT CONDITION. You're new to the sport, so a board that is easy-going and forgiving is essential, like the BURTON Feather Snowboard! This Flat Top board was built with Twin Flex which ensures your stability and balance. Its directional shape encourages flow, float and control so you can gain skill and confidence while you ride the day away. Once you've got the BURTON Feather Snowboard under your wing, you'll be soaring! A flat profile overall with subtle rocker rise provides an extra stable platform underfoot with a catch-free feel at the tip and tail. The flex is perfectly symmetrical from top to tail for a balanced fird that's equally versatile regular or switch. The classic snowboard shape, designed to be ridden with a slightly longer nose than tail to concentrate pop in the tail while still giving you plenty of float, flow, and control to rip any terrain or condition. A tapered shape means the nose is wider than the tail, promoting smooth turn entry and exit, stability at speed, an enhanced deep snow flotation. Look for different amounts of taper throughout the line. FSC Certified Super Fly® 800G Core. Lightened up and loaded with pop, Burton's dual-species wood core utilizes dual-density vertical laminations of alternating softwood/hardwood to reduce overall weight with no sacrifice in strength or performance. The wood grain is positioned along the toe and heel edges on two continuous zones, perpendicular to the rest of the wood core for consistent edge-hold and added strength. With an overall easier feel, Squeezebox Low brings high-end core profiling technology to the progressing rider. Stiffer zones just outside your feet create a more direct energy transfer to the tip and tail, while enabling a softer, smoother flex between the bindings. The end result is more control with less effort from the rider. Gives the board a jib and park friendly feel by softening the torsional flex. Speed, strength, and graphical pop in a base that requires little maintenance. Pass your friends without even waxing. A resin formulated with bio-based materials that reduces the carbon footprint by 50% over conventional all-petroleum-based epoxies. Less oil consumption means even less of a carbon footprint per board. Some riders want a more flexible board without sacrificing performance. Filet-O-Flex solves that challenge with ultra-thin profiling that creates soft boards that rip with maximum stability, durability, and grip. An additional benefit is subtle suspension and underfoot padding. Stronger, faster, easier, and more adjustable -- The Channel gives you ultimate control of your stance and your board in a design compatible with all major bindings (not just Burton's). Performance Products Warehouse (PPW) is an online retailer of ON SNOW, ON ROAD, and OFF ROAD parts. We strive to offer a large selection of items no matter what season it is. We personally test our products, so we can recommend the best parts and products for our customers. With our highly competitive prices and exceptional service, you are sure to be pleased with the products and knowledge that you receive from Performance Products Warehouse. Our ultimate goal is to continually provide the best pricing, service, and product information to our customers. Will be determined by country. Item must be brand new in original packaging. All new parts are guaranteed. All sales at Performance Products Warehouse are considered final. As our customer, we assume that you expect nothing less than a positive 5-star experience from our company and that is exactly what we strive to provide. Listing and template services provided by inkFrog. The item "WOMENS BURTON FEATHER ALL-MOUNTAIN FREESTYLE FLAT ROCKER DEMO SNOWBOARD 152CM" is in sale since Monday, September 17, 2018. This item is in the category "Sporting Goods\Winter Sports\Snowboarding\Snowboards". The seller is "performancesportswarehouse" and is located in Dumont, Colorado. This item can be shipped to United States, Canada, United Kingdom, Denmark, Romania, Slovakia, Bulgaria, Czech republic, Finland, Hungary, Latvia, Lithuania, Malta, Estonia, Australia, Greece, Portugal, Cyprus, Slovenia, Japan, Sweden, South Korea, Indonesia, Taiwan, Thailand, Belgium, France, Hong Kong, Ireland, Netherlands, Poland, Spain, Italy, Germany, Austria, Israel, Mexico, New Zealand, Philippines, Singapore, Switzerland, Norway, Saudi arabia, Ukraine, United arab emirates, Qatar, Kuwait, Bahrain, Croatia, Malaysia, Chile, Colombia, Costa rica, Dominican republic, Panama, Trinidad and tobago, Guatemala, El salvador, Honduras, Jamaica.